In a network meta-analysis published in JAMA Cardiology , Bundy JD et al reported that reducing systolic blood pressure below currently recommended targets with commonly used antihypertensive medications might significantly reduce the risk of cardiovascular disease and all-cause mortality. A study conducted by TUTSI Investigators and published in Hypertension found that simplified blood pressure cutoffs, used for defining prehypertension and hypertension in children, performed equally as well as the much more complex definitions currently recommended in the Fourth Report for predicting adult hypertension and subclinical CVD. Bundy JD and colleagues reported on the substantial impact the new 2017 ACC/AHA hypertension guideline may have on the diagnosis and treatment of hypertension, including increases in the prevalence of hypertension by 31.3 million people and in the number of adults recommended for antihypertensive treatment by 11.0 million, compared to the 2014 guideline. 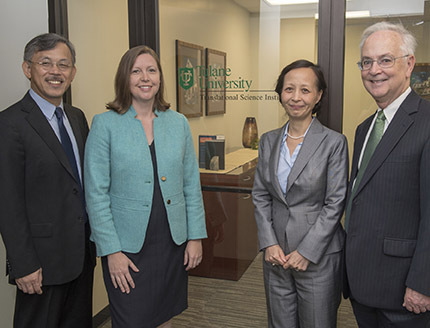 The Tulane University Translational Science Institute (TUTSI) is a university-wide research center that aims to promote and increase high-impact clinical, translational, and implementation research at Tulane University and Louisiana. TUTSI develops and nurtures successful competitive independent investigators engaged in clinical, translational, and implementation research; motivates and facilitates multidisciplinary and interdisciplinary interaction and collaboration among basic, clinical, and population scientists; and builds and expands the clinical and community-based research infrastructure at Tulane University and in Louisiana.